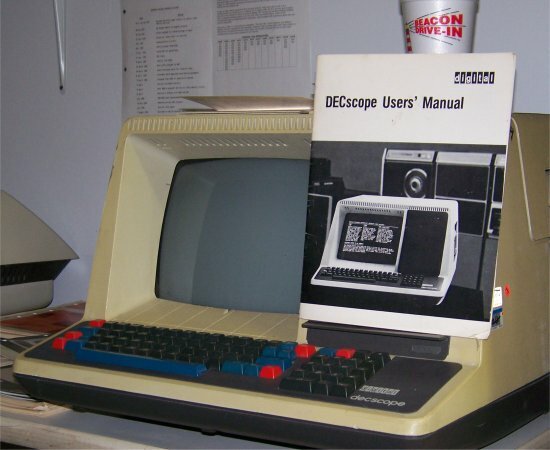 This working VT52 DecScope has the thermal printer option, which allows the user to print a copy of the screen to paper. The paper is in a roll in the upper right section of the DecScope. Note: The Beacon Drive-In cup on the top of the DecScope is there as a reminder to my friend Michael Senterfeit, who was in the Wofford College Computer Center in 1978 working at a VT50 DecScope, drinking a cup of Iced Tea from The Beacon Drive-In. He had the cup of tea on top of the DecScope. It fell over and spilled all over the keyboard. The VT50 quit working, and the DEC Man had to come out to Wofford to repair it.